With the right policy mix, China could achieve up to one fifth of its reductions in greenhouse gas emissions from agriculture, says Professor Pan Genxing, a researcher developing simple, innovative ways for farmers to capture carbon. chinadialogue (CD): How carbon-intensive is agriculture? What are its main carbon sources? Pan Genxing (Pan): Agricultural greenhouse gas emissions may account for over a third of all manmade greenhouse gas emissions. Direct emissions come from crop-growing and livestock farming, and indirect emissions from manufacturing of agricultural inputs. Direct emissions from the farming sector can account for up to 12 percent of human emissions. Globally, the main agricultural emissions are nitrous oxide, from dry fields, and methane from paddy fields and animal digestion. Combined, these two types of emissions account for 60 percent of all agricultural greenhouse gas emissions. China’s agricultural emissions are a low percentage of the total compared to other countries for two reasons. Livestock farming creates more emissions than crop-growing but is a smaller part of our agriculture. And rapid industrial development means most of our overall emissions come from industry. Emissions from livestock are calculated by herd sizes, how waste is handled, and the make-up of herds as cows and sheep produce different amounts of waste. For arable, calculations are done by quantities of fertiliser used. Nitrogen-based fertiliser is a huge source of greenhouse gases: one unit of nitrogen is equivalent to 300 of CO2, though there’s a lot less in organic fertiliser. However, in rice-farming, less than one third of the fertiliser used is actually absorbed by the crops. Agriculture uses up a lot of organic soil content, which forms the world’s major carbon store, yet it is not part of emissions calculations. Agriculture also uses 70 percent of the world’s renewable fresh water supply. Add the energy used for handling that water, and emissions linked to irrigation are be significant. We need agriculture that saves water and reduces emissions. CD: Over the years how have greenhouse gas emissions from agriculture changed? What has influenced that? Pan: Agricultural emissions are likely to have increased since China last published figures for the sector in 2005, when emissions from agricultural activity were at least 800 million tonnes in 2005, up more than a third from around 600 million tonnes in 1993. There are many factors influencing agricultural emissions. Dietary changes have meant more demand for animal proteins, such as meat and fish, driving up methane emissions. Increased fertiliser use and wastage are big contributors. Pesticide use only accounts for 5 percent of total agricultural emissions, but usage is rising. Growing amounts of waste – including straw and animal manure – are another factor, contributing between 20 percent and 30 percent of total agricultural emissions. Burning straw is becoming a more and more significant source. About 20 percent of straw (around 200 million tonnes) gets burnt annually in China, releasing the equivalent of 250 millon tonnes of CO2. Farmers traditionally took straw home as fuel – or essential domestic emissions but nowadays coal and gas are used, and the straw is burnt in the fields. Straw could be ploughed back into the field. But this would produce roughly the same emissions as burning it; either way, straw gets oxidised, quickly if burnt, or over a longer period when decomposing in soil. 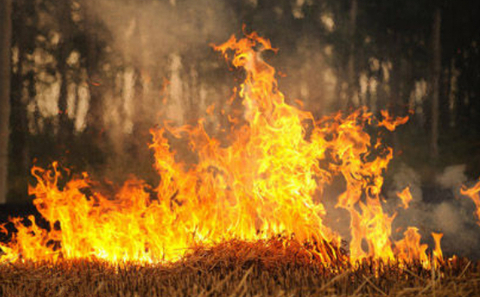 Burning also produces particulate matter, which doesn’t happen if straw is returned to the soil. Unfortunately, ploughing it back is producing issues with pests and micro-organisms, and meaning that hardpan soil - which is relatively impervious to water - become a more likely result. My team is looking at making fertiliser from straw. CD: What can be done to cut emissions from arable farms? Pan: Theoretically, plenty. Reducing over-use of nitrogen-based fertiliser would be the most effective step. Factory emissions would be lessened; farmers would save money; there would be less pollution. It’s the ideal method, but it's hard to do. China has hundreds of thousands of farmers using such fertilisers. You can’t tell farmers how to cut emissions. Higher usage is due to waste: farmers buy fertiliser by the bag, they take a bag out into the field, and it all goes on the soil. They can’t be bothered carrying it back, they’ve got other things to do – they seldom make money farming anyway. So one farmer uses half a kilo more than necessary, another uses an extra kilo – add it all up and you’re talking real quantities. Land consolidation would help. Farmers who have 50 or even 500 mu, not just 5 mu (0.33 hectares), will work more professionally; they won’t just dump fertilizer. Save half a kilogram of fertiliser per mu and over 500 mu you save 250 kilogrammes. Again, you’re talking real quantities. My research team worked out this could cut fertiliser use by between one fifth and one third. Another feasible approach is better management and handling of agricultural waste. Larger household farms can combine crops and livestock to reduce emissions from waste. Waste can be re-used; for example, using manure to generate energy could promote further emissions reductions. CD: What new ways to cut emissions has your research team found? Pan: What we’re doing now is looking at technology to make biochar, a charcoal fertiliser, from straw. The government subsidises farmers a sum in the tens of yuan per mu to discourage straw burning. We hope to use that money to start up straw-processing businesses. Trials of this technology are underway at many sites in China. The new method produces emissions from straw, but not from manufacturing fertiliser. By not burning straw some emissions are avoided. Each tonne of straw used could reduce emissions by 0.6 tonnes of CO2 equivalent, so 30,000 tonnes of straw a year could cut emissions by 200,000 tonnes. That’s equivalent to cutting farming emissions of nitrous oxide by 40 percent to 60 percent, and would increase organic carbon stores in the soil by 25 percent to 45 percent. Trials of this technology are underway at many sites. Those figures include not just direct emissions from burning or oxidisation of straw but also the reductions in direct and indirect emissions from manufacture and use of nitrogen-based fertilisers. At present, even more is spent on preventing straw burning than on the subsidies, a single Chinese county might spend hundreds of thousands of yuan. China’s agricultural sector is large, but dispersed, and commercialisation has been slow. So there may be limited scope for emissions reductions in agricultural production itself. But if technologies can be commercialised and put into operation by business, then with government backing there’s huge potential for reductions. China is also promoting some indirect methods of reducing emissions, such as conserving water in agriculture, ploughing straw back into the field, improving management of manure – all these could cut carbon. There are also ways to reduce the amount of tilling. We’ve combined trials and models and found that, in comparison with standard tilling and across different agricultural regions, conservation tilling can reduce CO2 emissions by between 1.0 and 4.09 tonnes per hectare, while maintaining or even increasing yields. Better application of fertiliser can cut CO2 by 0.54 to 2.16 tonnes per hectare. China now includes agricultural activity within the scope of voluntary emissions trading, and using agricultural carbon storage to offset industrial emissions would be a beneficial approach. It should be possible for agriculture to account for 20% of notional emissions reductions on a countrywide level. And with industrial growth slowing, agriculture’s contribution could take an even bigger share of overall emissions. China is expected to outline its agriculture emissions in much greater detail later this year, when the country, along with most other nations, is required by the UN to submit national plans on how carbon will be cut in major sectors.